Hey there, you look kind of funny when I do this! 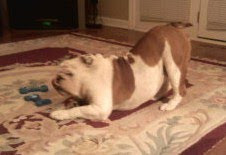 This is my favorite yoga pose - I call it the "one-hump camel". Now, here is where I am really feeling zen-like, good for the bones and good for the soul! Try it, you'll feel great all day long! Some advice to my friends out there, just relax! Okay Snuffles, Annie, Emma, Luna, Tonka, Presley, Friday, Penny, Dizzy and Snickers? 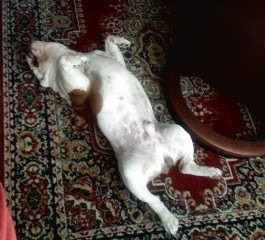 Ahh, I love to see a happy relaxed dog! I also enjoy the changing pictures of your beautiful cat! Thanks for the tips, Apollo. I'm ready to relax now. Have a great weekend and try not to move around too much. All 3 of my dogs sleep this way. It means they trust us so much. Also they like to keep their bellies cool. Annie can be found sometimes during the night on the couch with head on pillows. She knows how to relax too. 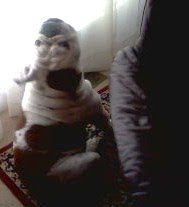 doggie yoga - what a hoot!! !